Activist Sophia Sahrane, a recent Concordia University graduate, is an employee at the Racines bookstore in Montreal North. PHOTO FRANCA G. MIGNACCA. Empress Rosiclar was a step short of hugging me when I walked into Racines, a bookstore. The walls were splattered with colour, music was playing in the background, and there was art. Racines is bookstore gold. Located in Montreal North, at 4689 Henri-Bourassa Blvd. East, the store has a feature that makes it special: it only carries books and art made by people of colour. All of the art on the walls is created by local, racialized artists, Rosiclar explained. Rosiclar has worked there ever since the bookstore opened on August 5. Sophia Sahrane, a Concordia graduate and employee at Racines, said the purpose of the bookstore is not to find a balance between racialized and non-racialized authors and artists, because that is impossible. Instead, the purpose is to represent racialized people. “It’s an independent store, nobody funds us,” said Rosiclar. “We are very new, and it shows,” Rosiclar said. They’ve used up most of their funds, she admits, and this is why they are now only open three days a week. Their profit mainly comes from book sales and hosting events. Racines carries books written in English, French, and Creole. 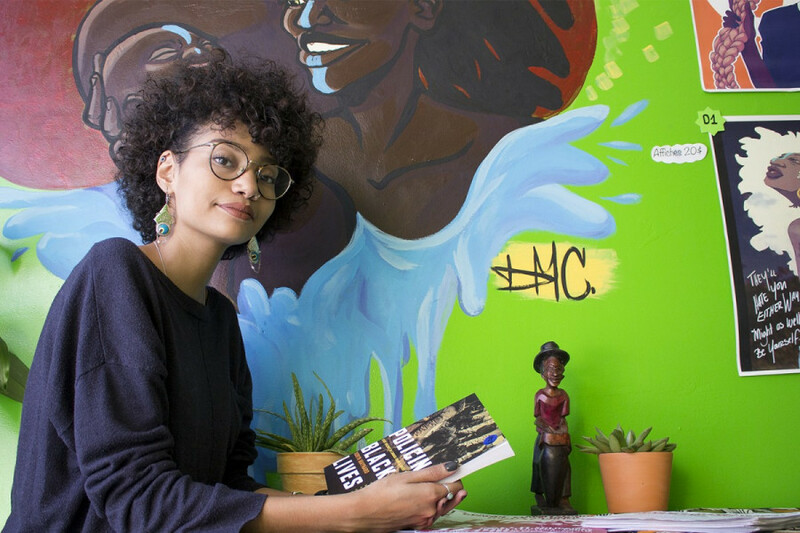 They have a wide selection of books written by Montrealers, like local activist Robyn Maynard’s new release Policing Black Lives. Local authors and artists pass by to sell their works at Racines all the time, said Sahrane. They also have works by international authors, including The Kite Runner by Khaled Hosseini and Ru by Kim Thúy. If they don’t have a specific book that a customer is looking for, Racines will often order it for them. Art by local artists is also sold at the bookstore. PHOTO FRANCA G. MIGNACCA. It’s all for sale, by the way, Rosiclar said, waving a hand in front of her. Everything, from the plants on the tables, to the statues—and it’s all affordable. Books tend to cost between $7 and $13, and those on the bottom shelves are sold for $5 or less. They also have a handful of books that they give away for free. The people who come to the shop are diverse. Everyone has different languages on their tongues, different kinds of loves, yet are all under the same roof, attracted to this little literary safe haven. 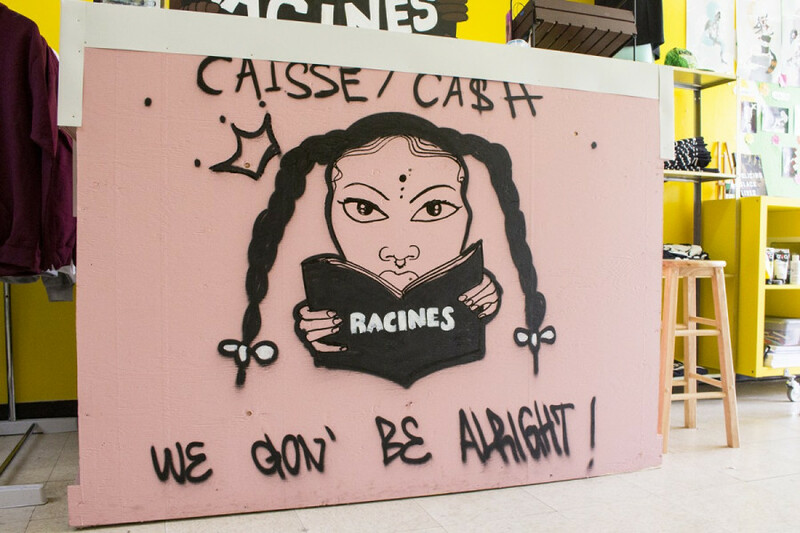 Racines isn’t just a bookstore, said Rosiclar. She continued that owner Gabriella Kinte’s main goal was to create a safe space, a second home for people. They always have music playing, and offer customers coffee or tea, she said. It’s not only about making money. The bookstore is open to all ages and races, but is especially catered to Montreal North’s racialized youth. The space has posters and postcards depicting LGBTQ+ and fantasy art. They also sell dolls for children depicting women of colour and t-shirts with political statements saying things like “Youth of Colour, You Matter.” Rosiclar skipped happily around the room while showing off the products, a genuine smile on her face the entire time. This place is important, she said, because it’s the first of its kind in Montreal. Montreal North is a racialized community, added Sahrane. In 2014, 42.9 per cent of the community was listed as being part of a visible minority. “When we talk about segregation in Montreal, I think of this borough,” Sahrane said. When she was a little girl, she said, she felt like she didn’t fall into the stereotype of “blackness” because she loved to read—she felt marginalized. And, when she did read, the characters in the books never reflected who she was. And now, the youth of Montreal North have an opportunity to experience this as well. Sahrane shares this sentiment. “[People of colour] are pegged with a certain stereotype and can’t escape that. So, racialized individuals often just stick to their stereotype and caricature, which perpetuates the subordination of racialized people, and the supremacy of white folk,” she said. The bookstore is safety and family oriented, said Rosiclar, and it is not just for book and art lovers. Racines also hosts multiple events throughout the month, about a variety of subjects. “And it worked!” Empress said, laughing. “A space is finally created for folk to not have to justify their existence,” said Sahrane. “It is important for racialized folk because we are often silenced when we try to engage in conversations about racism.” At Racines, people can talk about their experiences only if they want to, and at their own pace. Racines is a good resource for learning as well, said Sahrane. Teachers come in trying to find books to read their elementary school kids with racialized characters. A lot of non-racialized people come into the space and want to understand, for example, how feminism is whitewashed. Racines has an educational value for non-racialized people to learn without being shot down, or tokenizing their “only black friend” by bombarding them with questions about living while black. They meet people at Racines who want to share as much as possible about their personal experiences, within respectful boundaries, and who want to educate others. Everyone who works on their small team is very involved in the community. The owner Gabriella Kinté, for example, is involved with Montreal Noir and Black Lives Matter Montreal. Racines is a very small scale resource, said Sahrane. They do outreach work at schools and with educational associations such as the Federation autonome des enseignants, but there is only so much they can do. Systemic racism is such a massive issue, said Sahrane, and she hopes other spaces like this one are created. The bookshop is also a place for people to meet and talk, said Rosiclar. Kids pass by to just hang out. There is a comfortable leather couch for people to sit, a little corner for children, set with a colourful table and chairs, toys for them to play with and books for them to read, and a table with a couple of chairs at the entrance of the store. That is my favorite place in the store, said Rosiclar, pointing at the table with a wooden statue and two cacti as decoration, by the door. That table is perfect for conversation, and for sharing, she said. The clientele is already faithful, she continued. She isn’t sure if it’s the way they accept and welcome people, but they would always come back, she said. Rosiclar wasn’t exaggerating when she welcomed me to the store. Racines schedules monthly events. Check their Facebook page, Racines, or at 4689 Henri Bourassa Blvd. East.